One name, two very different versions of GeForce Now. When is GeForce Now not GeForce Now? When it’s GeForce Now for PCs. We should’ve seen this coming when the beastly Titan X was succeeded by, uh, the Titan X—a completely new graphics card with the same ol’ name. Nvidia’s following in the footsteps of Apple by sticking with a single designation for its flagship products. But with GeForce Now, it’s wading into Microsoft’s frustrating territory by giving two very different services the exact same name. At CES 2017, Nvidia announced GeForce Now for PCs and Macs, which lets you stream PC games from the cloud to any PC or Mac. You’d think it would be an extension of GeForce Now, the existing Nvidia service that streams PC games from the cloud to the Shield TV console (which received a major update of its own at CES). Nope. Not in the slightest. GeForce Now and GeForce Now are two distinct, different services with wildly varied features, capabilities, and pricing. It’s confusing as hell, especially since Nvidia didn’t acknowledge those differences in any way during its CES keynote, where both the new PC service and the new Shield TV were highlighted. Now that the new Shield TV has hit the streets it’s time to clear up that confusion. Here are the key contrasts between the two GeForce Now services—which extend to their core design philosophies. Let’s start with GeForce Now for Shield TV, the original GeForce Now. The only way to access this service is through Nvidia’s console. GeForce Now for Nvidia’s Shield. This GeForce Now focuses on PC games you can play with a controller, playing to the strengths of the Shield TV. So you’ll find games like Witcher 3, Mad Max, and Sonic & All-Stars Racing Transformed (a.k.a the best kart racer around) but not keyboard and mouse-centric ones like Planet Coaster or Civilization V.
GeForce Now for Shield TV is primarily a subscription service. Paying $7.99 per month—after a free first month—gets you instant access to over 60 games you can play as much as you want, including the original Tomb Raider reboot, the superb Darksiders series, and Ultimate Street Fight IV. Most of the games included with the subscription are getting a bit long in the tooth, but you’ll still find some real gems in there. 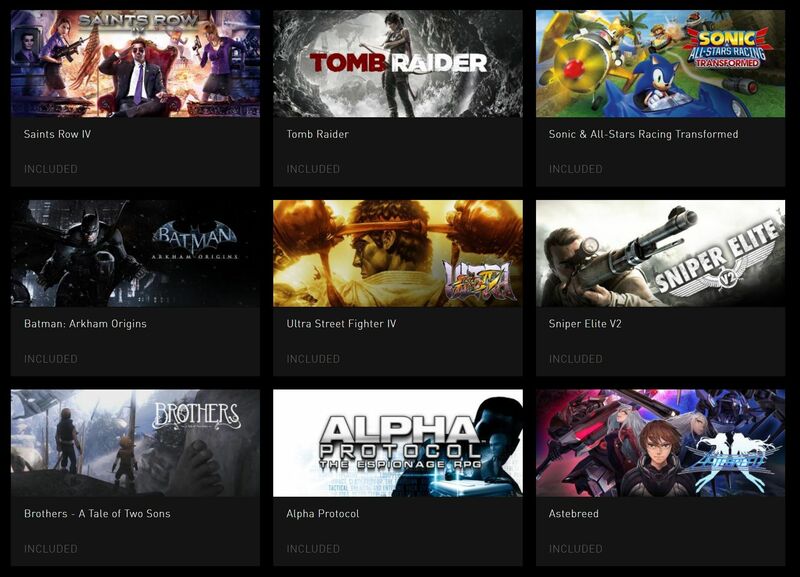 Some of the games included with a GeForce Now for Shield subscription. That said, Nvidia also offers a decent selection of additional PC games you can buy at full price, then stream to your Shield. Most newer games (including Ubisoft’s lineup, which is coming to GeForce Now for Shield soon) will need to be purchased separately from your subscription. 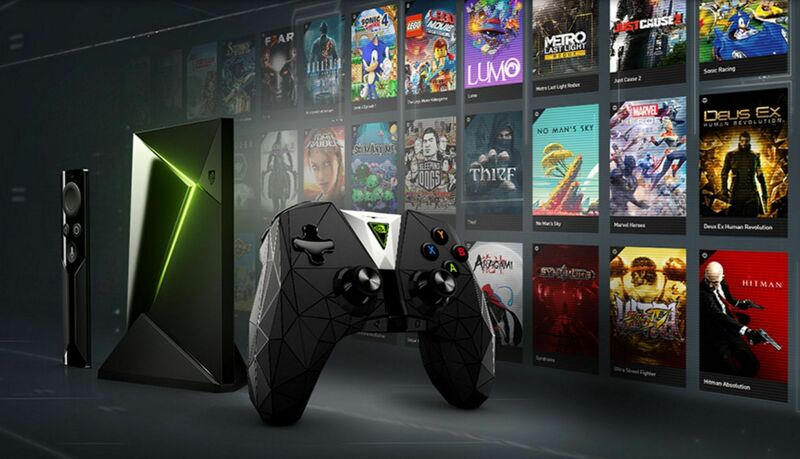 Nvidia also provides Steam keys for every PC game you buy through the GeForce Now store, but be warned: GeForce Now for Shield TV doesn’t play nice with Steam’s cloud saves, so your progress won’t transfer between the two platforms. 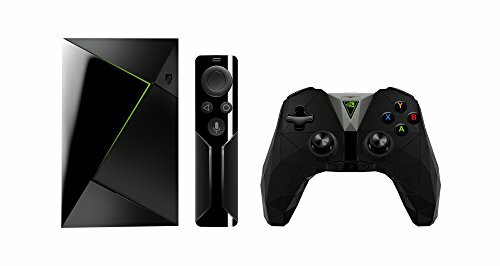 You don’t get to choose what sort of hardware powers your GeForce Now for Shield TV experience. Instead, the system automatically assigns you a virtualized graphics card based on what it takes to keep the game you’re playing running at a smooth 60 frames-per-second at optimal settings. Nvidia’s fortifying the backbone of this iteration of GeForce Now to coincide with the launch of the new Shield TV, supplying up to GeForce GTX 1080-levels of firepower when it’s needed. Now let’s talk about GeForce Now for PCs and Macs. It’s nothing like GeForce Now for the Nvidia Shield, and you can’t even access it on the Nvidia Shield. Many details will be murky until the service’s early access launch in the continental U.S. in March, but I’ve used GeForce Now to play Witcher 3 on a Mac (sacrilege!) and have the basic info. GeForce Now for PCs and Macs is not a game subscription service. 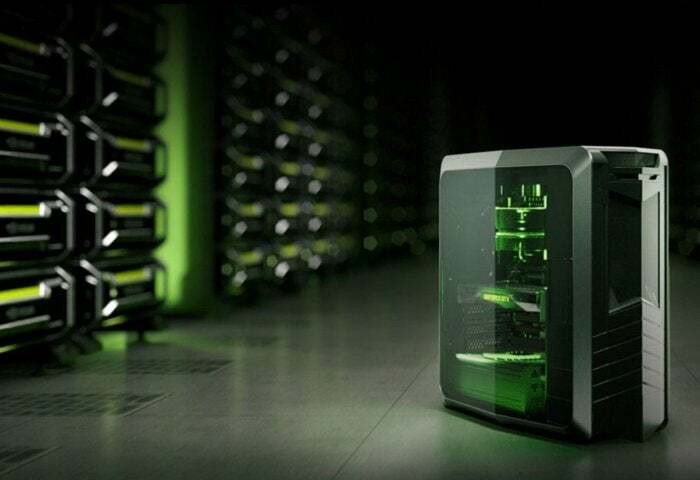 Instead, you pay to rent a powerful virtualized gaming PC from Nvidia’s server farms. You can install any PC games that you own, from any of the major PC gaming platforms—Steam, Origin, Blizzard, you name it—onto this virtual PC. Unlike the Shield-based service, GeForce Now for PCs and Macs does not give you access to any games whatsoever. You’ll need to bring your own, period. Nvidia provides up to 1TB of virtual storage space to install games, and once you’ve installed a game in GeForce Now, Nvidia will keep your drivers and games updated automatically. Because the virtualized PC resides in Nvidia’s cloud, you can then stream the games you install on it to any PC or Mac equipped with Nvidia’s GeForce Now program—even if your physical PC could never, ever dream of high-end gaming. This version of GeForce Now changes its pricing depending on how much graphical oomph you need. Spending $25 gets you 20 hours on a virtual PC with GeForce GTX 1060-quality graphics, or 10 hours on a beefier virtual system with a GTX 1080. You can change between those on the fly as well, streaming from a GTX 1060 system when you play Planet Coaster or a GTX 1080 system for, say, The Division. Nvidia says that where the Shield version of GeForce Now is optimized for controller-based games, GeForce Now for PCs and Macs was designed for the keyboard and mouse. That doesn’t really feel accurate because you can play any PC game you own on GeForce Now for PCs and Macs, but it at least helps you understand the different driving forces behind the two services. And what wildly divergent services they are! But now you understand what GeForce Now for Shield TV and GeForce Now for PCs and Macs each bring to the table, so you know exactly what you’re getting into with each. Here’s hoping Nvidia figures out how to make those differences more clear in the future—or even better, a way to merge both services into a single, overarching GeForce Now offering.